The High Park Fire raging near Fort Collins, Colorado, fueled by high winds and record heat has grown again over the weekend burning an additional 57 homes, bringing the total number of homes destroyed to 248. It is the largest fire of more than half a dozen major wildfires that are burning throughout the state in the worst wildfire season Colorado has seen in a decade. More than 2,000 firefighters battle the blaze that has now consumed 83,205 acres as of Sunday night, according to InciWeb.org. The fire is now the second largest fire in Colorado history as well as the most destructive. Firefighters had been gaining ground on the fire last week, but the high heat and wind over the weekend proved to be devastating. Containment fell from 60 percent on Thursday to 45 percent on Saturday -- the rate at which it remains on Monday. On Friday, the fire crossed the Narrows in Poudre Cannyon, The Coloradoan reported, burning through subdivisions in the region. According to InciWeb.org, hot shot crews were attempting a direct attack of the raging spot fire, but due to the intensity and rapid spread both the hot shot crews and engines involved in structure protection in Glacier View had to pull back for safety reasons. This new spot fire burned aggressively toward the northeast and an additional 10,000 acres burned in the Glacier View area by Saturday night, according to InciWeb.org. "We thought the worst was over because they said it was going up Rist Canyon," Judy Devore, resident of Larimer County, told 9News. But unfortunately conditions got much worse Friday -- The Denver Post reports that the fire burned at least 10 additional homes on Friday, however the official number of homes destroyed remains at 191. The blaze moved northward after some embers that blew from the main fire sparked a spot fire north of Poudre Canyon -- by Friday evening the spot fire had grown to at least 2,000 acres. The Larimer County Sheriff's Office ordered 998 evacuation notices to homes in the region on Friday. Under a Red Flag Warning from the National Weather Service -- which went into effect at noon on Friday and remains in effect through Monday evening -- temperatures rose to triple-digits near the fire zone, gusts blew at more than 30 mph and relative humidity was near zero. Good progress was being made during a brief period of cool weather as evidenced by fewer heat sources identified by infrared imagery, according to InciWeb.org. However, officials say that it could be weeks -- or even months -- before the fire is completely under control. Last week, reporters were given a tour of a burnt out community along Larimer County Road 29C, Missile Silo Road. 9News' Kevin Torres spoke with firefighters in the area who spoke about the devastation and the time it will take for the area to recover -- at least a generation, firefighters said. 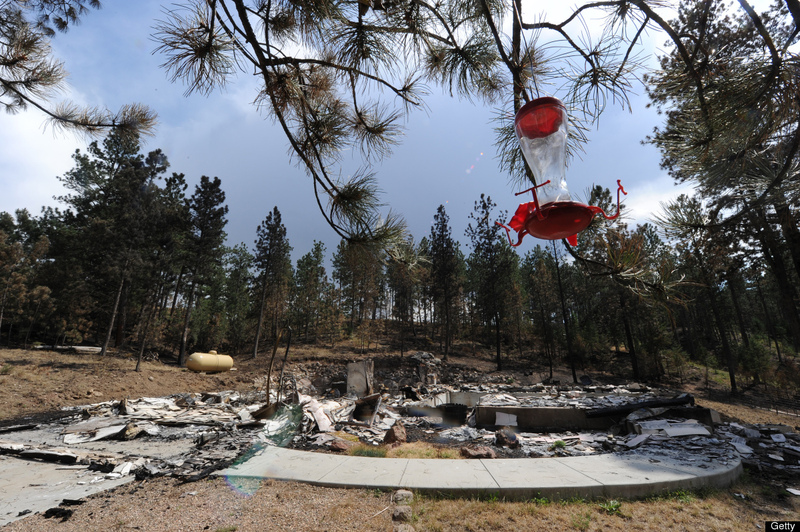 Patrick Love of the Poudre Fire Authority told Torres, "Most of us will be dead before things look the way they used to." Burning since June 9 and now on its 17th day, firefighters battle the wildfire with the help of 19 helicopters, 5 heavy air tankers, 170 fire engines and 12 dozers. The cost of the fire to date is $29.6 million. The massive fire has now burned approximately 129-square-miles -- to put this size into perspective, that's approximately the same size as the cities of Boulder, Broomfield and Fort Collins, Colorado combined. At 11:53 p.m. on 6/22 Fire officials issued PRE-evacuation orders for the Bonner Peak area, including the area from Springs Ranch Road on Hwy 287, north to CR76H, west to CR37, south to CR74E, south to CR74E and back east to Hwy 287. An evacuation order for the 9th, 10th and 11th filings of Glacier View, to include the area west from Eiger Road to Rams Horn Mountain Road and north from the Mount Blanc Guardian Peak area to the north end of Mount Everest Drive, was issued. Evacuations were also ordered along Many Thunders Road and south into the 12th Filing of Glacier View. The road block is located at Eiger and Many Thunders Mountain Road. An additional roadblock is located at Green Mountain Drive at CR 74E.